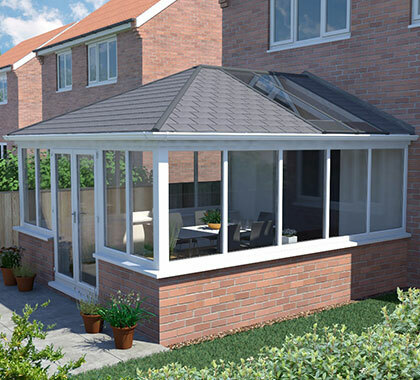 When looking to upgrade and replace your conservatory roof, you’ll need to decide if you want fully glazed, LivinRoom, LivinRoof or the NEW UltraRoof lightweight tiled roofing system, this gives you the most advanced roof available on the market today. 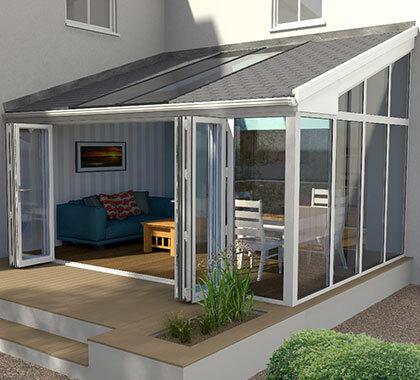 UltraRoof overcomes the problem of your conservatory being too hot in summer and too cold in winter. Moreover, it creates a beautiful vaulted plastered ceiling inside – and on the outside a stunning lightweight tiled finish in a choice of 3 colours to match or co-ordinate with any home. For those who want a solid roof but still want to retain an element of light within the room, the clever configurable technology in the UltraRoof allows the installation of multiple rectangular glass panels or Velux roof windows – this can help project light into the adjacent room and give you a truly bespoke design. Extremely thermally efficient due to its advanced design, UltraRoof is fully compliant with Building Regulations. The external fascia boards are available in different colour choices to match or contrast with your existing window frames: White, Black, Rosewood, Oak. Depending on your preference, full glazed rectangular panels or Velux windows can be inserted into the roof to enable natural light to flood into the room. High performance glazing can be used to further enhance the experience of your new room. This glass can help reduce glare from the sun and control the amount of heat that you allow into the space. I want to have some pendant lighting and spotlights around the perimeter – how feasible is this? Suspending pendant lights at the highest point of the vaulted ceiling is no issue as there are structural braces inside the plasterboard to take the weight of the lights. And spotlights can fit naturally into the 300mm deep pelmet that runs around the perimeter – this can even be varied to make this pelmet even more pronounced. I am nervous about losing light into my adjacent dining room and I want to keep the room light – what can be done? 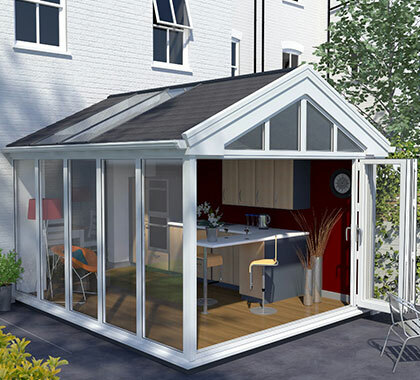 LivinRoof and UltraRoof380 (Rectangular panels only) has the option to have inserted in virtually any position glazed panels to allow light into the existing home. Will the solid roof be too heavy to sit on my windows? much heavier than a glass roof. This often enables the original window frames to be used providing a saving to the homeowner if required. The difference in loading on the foundations is negligible. Provided there is no sign of settlement in the base there is no need to “boost” the foundations. Please just ask us if in any doubt. Changing to a solid roof means it has to comply with Building Regulations, is there any paperwork I should keep? In Milton Keynes Custom Glaze works with an approved inspector organisation. They ensure the necessary procedures are followed and issue a completion certificate for you, which you can file with the deeds to your property. Is there a weight problem removing the existing lightweight plastic sheeting in the roof and adding a solid roof? assess the existing base and window frames to ensure they are capable of taking this extra loading. If there is any doubt they will advise of the correct solutions and costs. UltraRoof380 with its authentic slate finish weighs a little more but is still an option! 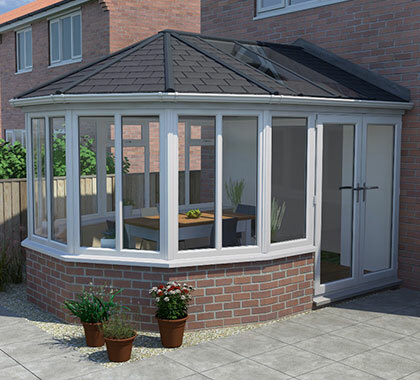 The existing conservatory has multiple shapes – Can it be upgraded? 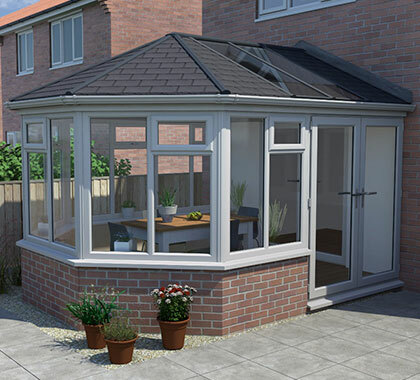 the shapes and styles of conservatory out in the market. 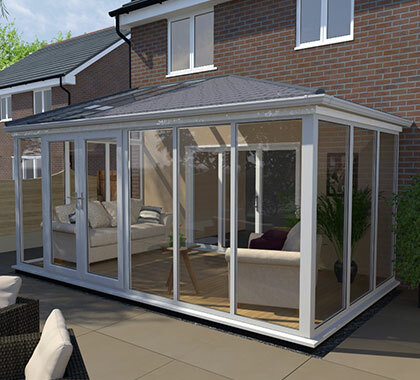 I am thinking of replacing my old polycarbonate roof with a solid one – is there any “red tape” involved? 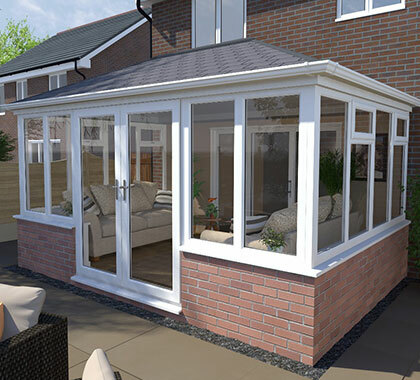 An existing conservatory with doors into the house is “exempt” from Building Regulations but changing the roof to a solid one means that Building Regulations now apply. Don’t worry, Custom Glaze will take care of everything. Internally the UltraRoof is second to none. Around the perimeter of the ceiling sits an internal pelmet which can be used to insert spotlights or speakers and at the apex of the roof you can choose to add a flat panel enabling you to insert down lights or hang pendant lights for main or mood lighting. UltraRoof has a proven pedigree and will provide comfort and peace of mind for many years to come. The complete roof is pre-fabricated off site to ensure consistent quality on site and speedy installation with minimal waste and minimal disruption to your home compared to other tiled roof solutions. 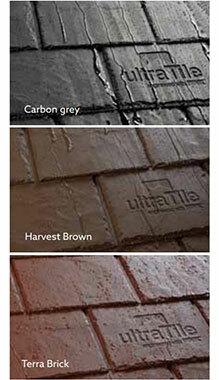 Choose from three colours for your authentic tile finish (Carbon Grey, Harvest Brown and Terra Brick).